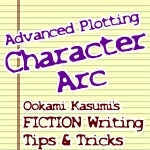 For the record, a Character Arc can be used all by itself as the plot-line for a story or in addition to an actual Plot Arc such as The Heroic Journey, or any of hundreds of Plot Arcs found in books and on the 'net. My personal choice is to use a Character Arc in addition to a Plot Arc, but that's just me. Stories are about CHANGE; about adapting and overcoming circumstancing that should take the characters down physically AND emotionally -- and that takes Angst. In a solidly built story, both hero and villain change and develop emotionally as well as physically. Changing takes suffering. Both the hero and the villain should suffer emotionally and physically to make those personal changes happen. Think about how hard it is for YOU to change your mind about liking or disliking anyone. What would it take to change your mind? That's the level of suffering - of Angst - you need. However, the ultimate difference between the Hero and the Villain is the Villain's failure to face his fears and make the final sacrificial emotional change. This inability to change and Mature is what allows the hero to take him down. In short, in a battle between Maturity & Immaturity, Maturity always wins. This isn't fiction. This is Fact. Without maturity, and the emotion of Compassion that comes with it, the human race would have wiped itself out in petty selfish squabbles ages ago. In fact, it almost did as recently as WWII. Everyone deals with one form of angst or another on a daily basis. You're on your way to work. You go out to your car, put the key in the ignition and turn it on. You hear nothing but a grind; the battery is dead. Think about how you typically react: What's the first thing you do? "Damn it... Why does this crap always happen to me? Sure, I had problems starting it yesterday, but I didn't think it was this bad." "Start damn it!" Perhaps you slam your hand on the steering wheel? Then you try it again. "Damn you! Start! Start! Start! Please car, if you will just start one more time I promise I'll buy you a brand new battery, get a tune up, new tires, belts and hoses, and keep you in perfect working condition…"
"It won't start. Crap. If only I'd taken it to the shop when I had the chance." "Crap, crap, crap... I need to get to work! Should I call in to work and tell them I'm not coming in, or just say I'm going to be late?" "I need the cash too badly to skip out of work; especially now with the car. I'll call a taxi or maybe my friend and see if they can get me to work?" You pick up the cell phone and start dialing numbers. "I'll call the mechanic from work and ask them to look at my car. Hopefully, it won't be too expensive to fix it." 1. Shock & Denial – "This can't be happening to me!" An Inciting Event has happened to ruin the Protagonist's blissful ignorance. Rather than deal with it the Protagonist keep going as though it never happened: "I'm busy! Go away!" In The Thirteenth Warrior – Ibn Fadlan is an Arab noble who is literally pulled into a Viking adventure he wants no part of. 2. Pain & Guilt – "If only I hadn't..."
The situation is no longer avoidable. It's right there staring them in the face and the Protagonist suspects that what happened is their own damned fault – even if it isn't. In The Thirteenth Warrior – Ibn knows for a fact that he'd been sent out into the far reaches of civilization because he'd fallen in love with a noble's wife. However, his own mouth is what gets him into trouble with the Vikings -- and why they decided to take him with them on their monster hunt. 3. Anger & Bargaining – "Screw You!" The main character does everything in his power to wiggle back out of the situation by way of threats, bribes, and outright begging. This is also where the Antagonist has his best chance of strong-arming the Protagonist into getting what they want by offering a quick solution – a bargain – that the Protagonist simply cannot refuse. In The Thirteenth Warrior – Ibn has finally arrived in the far distant land and learned the language of the Vikings. It is then that he finds out exactly what sort of barbarous monsters he and his 12 companions are expected to defeat – and that they are in the thousands. To make matters worse, the king of that land is old and his son power hungry. 4. Despair & Reflection– "We're going to die." This is where your characters realize exactly what they're up against and just how overwhelming the enemy truly is. Not only is their boat surrounded by alligators, a few more are in the boat with them disguised as friends. In The Thirteenth Warrior – Ibn and the Vikings learn that the monsters are undefeatable. The Great Hall can not be defended. There are just too many. Another solution must be found. 5. Precipice & Choice – "Give up or go down fighting?" Quite literally trapped in a "damned if you do, and damned if you don't" situation, desperation forces the Protagonist to make a personal Sacrifice during an emotionally heavy Ordeal (often provided by the Antagonist.) This often means facing the Protagonist's main debilitating fear -- and conquering it. This success gives them the inner strength to deal with their situation. In The Thirteenth Warrior – In the hopes of taking out the two leaders of the monster tribe, Ibn and the Vikings sneak into the Monsters' vast caves with the full knowledge that it's a suicide mission. During this sneak attack, Ibn and the Vikings face a number of their fears and conquer them. 6. Reconstruction & Adjustment – "Okay, so here's the plan..."
The Protagonist finally gives up and commits himself to what needs to be done. Home is so far away it no longer matters. The problem at hand matters. In The Thirteenth Warrior – Ibn and the Vikings have succeeded in taking out one of the leaders, but the other still survives. An attack is coming and there is nothing they can do but try to defend themselves. 7. Acceptance & Hope– "We'll make them regret messing with us!" With nothing left to lose, they throw themselves into the fray. In The Thirteenth Warrior – Knowing that they are vastly outnumbered, Ibn and the Vikings fully expect to die, leaving them nothing left to fear. However, there is still the chance that the final leader will show his face. If one of them can succeed in killing him, hopefully that will stop the invasion before the monsters kill every last man, woman, and child. "Does my character's arc have to be so…depressing?" In the Stages of Grief, the word "Grief" is actually misleading. The stages aren't strictly about crushing depression. They merely map the cycle of someone under emotional pressure created by conflicts; and story conflict should create emotional pressure for your characters. Never forget: Stories need Emotional conflict to be fulfilling. However, the emotional conflict doesn't have to be Horrific! The stages can be softened. - "Okay, so maybe I could have...?" - "You stay out of my way, and I'll stay out of yours. Okay?" - "How do I always get myself into these messes?" - "You know what? I don't need this crap!" -- "That's one less problem to deal with." - "Oh, now I have time to do other things." "Do these stages go in EXACTLY this order?" Denial ALWAYS comes First. Acceptance ALWAYS goes Last. The others can be juggled around as you please. Feel free to Experiment! "Where the heck did you find these Stages?" Human Psychology. You can look it up on Google by typing in: stages of grief. "Are there Other maps for Character Arcs?" Absolutely! Any human behavior pattern can be used as a Character Arc map. "The Stages of Grief" is merely the easiest to work with and most commonly used. Using a Character Arc is one of the best ways to enrich an otherwise dry event driven story. However, that's not the only function it serves. Outlining a Character Arc for each of your three main characters (Hero, Ally, Villain,) is your most powerful Secret Weapon toward keeping your characters from running all over you. Knowing your Characters' emotional stage allows you to choose the events and situations that will Force your characters to make the decisions needed to make your ending happen. After all, it's YOUR story.